After a nightmare start to the season, Thatcher Demko is now living his dream. Nearly five years after he was drafted by the Canucks in the second round, 36th overall, the player many have pegged as the team’s goaltender of the future has finally arrived in Vancouver. If all goes according to plan, he’ll be here for good. A lot of attention was on the 6-foot-4 goaltender at his first full practice since being recalled by the Canucks last week. 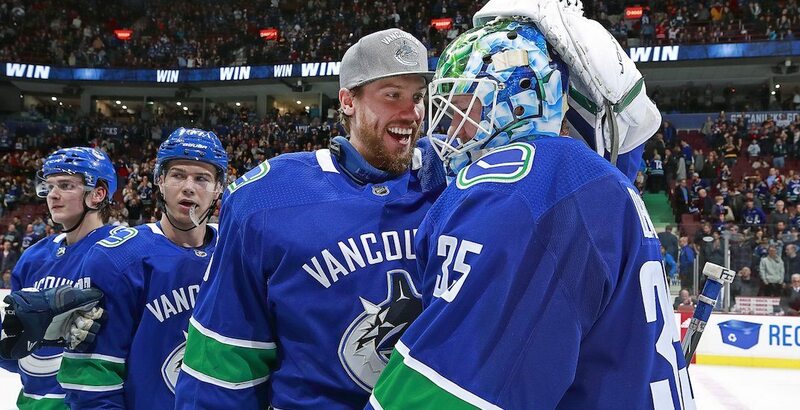 With Anders Nilsson traded and Mike McKenna lost on waivers, Demko is the only viable option left in the organization to back up Jacob Markstrom. That means he has arrived as an NHL goalie, it’s now up to him to develop into a good one. After an outstanding year with the Utica Comets in 2017-18, it hasn’t been easy for Demko this season. The 23-year-old took a Brendan Leipsic shot to the head in a September 23 Canucks practice, suffering a concussion which put an end to his training camp. Demko spent the next two months on the sidelines. Demko didn’t return to game action until November 21 with the Comets. By all accounts Demko is ready to make the jump to the NHL. Poised to share the crease with Markstrom for the second half of the season, the Canucks are currently in the lightest part of their schedule, with just six games to play before February 2. That means plenty of practice time with the NHL club. His workload remains a bit of a question mark. It’s clear that Demko needs to play, not just for his development, but to give Markstrom a rest. In 16 games with Utica this season, Demko has an 8-5-1 record with a 2.58 goals-against average and .911 save percentage. Last season, Demko finished with the second best save percentage (.922) among AHL goalies with 40+ games played, to go with a 25-13-7 record and a 2.44 GAA. Demko has just one game of NHL experience, winning in his NHL debut on March 31 of last year. He made 30 saves that day in a 5-4 overtime win against Columbus. As astute as can be, Demko has analyzed every aspect of that game. It’s not easy playing the position of goaltender, particularly in Vancouver. The ‘goalie graveyard’ has claimed victims in the past and when you get the tag of ‘goalie of the future,’ the weight of expectations becomes heavy.